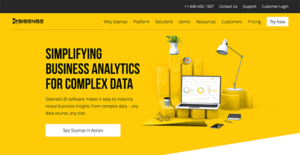 Sisense is a business intelligence platform that lets you join, analyze, and picture out information they require to make better and more intelligent business decisions and craft out workable plans and strategies. It is highly flexible for any business size, ranging from startups and developing enterprises to Fortune 500 giants including Sony, ESPN, Comcast, and NASA. It won our Best Business Intelligence Award for 2018 as well as our 2018 Supreme Software Award. Sisense also currently occupies the highest spot on our list of top 10 business intelligence apps. With Sisense, you can unify all your data into visually appealing dashboards via a drag and drop interface. Sisense basically allows you to turn data into highly valuable insights and then share them with colleagues, business partners, and clients via interactive dashboards. Business analytics is easily accessible for each member of your organization as the software ensures easy discovery of business insights regardless of their experience in the field or the complexity of data. Sisense enables you to clean and consolidate data so you can explore and visualize it in a way that brings you valuable insights into your business. Gather all your information from all your sources and unify them into a single, accessible repository. Produce rich and intelligent analysis using robust visual reports without going through the hassle of preparation. Easily share your insights with your team, partners, and clients. Easy to use interface allows non-techies to quickly adapt and get acquainted with the system. Very fast system as it maximizes the potential of 64-bit computer, multi-core CPUs and parallelization capabilities. Instant Deployment: The app’s Single-Stack architecture takes you from data integration to visualization with a single BI solution, eliminating the need to use additional tools. Shortest Time-to-Insight and Unmatched TCO: Sisense covers the full scope of business analytics in one agile BI software, from preparing complex data for analysis to creating dashboards with a wide variety of visualizations. With no DBA required to manage the platform, no manual mashups to maintain, and no special scripts to learn, Sisense provides a complete business intelligence platform at unmatched TCO. Minimal Total Cost of Ownership: With Sisense’s Single-Stack software, you’ll enjoy the benefits of using a single tool to prepare, analyze and visualize any type and size of data, saving you the need to invest in data warehouses, visualization tools or professional services. With no DBA required to manage the platform, no manual mashups to maintain, and no special scripts to learn, Sisense provides a complete business intelligence platform at unmatched TCO. Sisense’s In-Chip engine enables you to run BI analytics easily through drag and drop functionality. This allows you to process BI in-house and saves you the cost of paying for professional services or maintaining a technical unit. Unparalleled Performance: The award-winning In-Chip technology at the core of the Sisense engine allows it to effectively use CPU cache memory as well as process and prepare data only when a new query is made. Concurrent, ad-hoc queries return results in seconds, even when working with billions of rows of rapidly changing data. Sisense is robust, yet easy to use: Sisense uses proprietary technologies to allow even lay users to use the platform. But make no mistake, this app offers robust BI features. The In-Chip engine makes data preparation simple and fast. It allows you to make various queries and get fast answers without needing to apply data rules for each query. To optimize CPU performance, the data is prepared only when a query is made. This means Sisense is adaptable to commodity server infrastructure and you do not have to invest in high-end servers. Sisense’s Single-Stack system allows you to do multiple tasks from data integration to visualization in a single BI platform. This means you do not have to use star schemas, OLAP cubes, and data warehouses to manage complex calculations and data modeling. Plus, Sisense offers integration and built-in connectors which allows you to easily integrate source files from applications such as Excel and Google Adwords, CRM reports from Salesforce and Zendesk, and data from a range of popular apps. Sisense’s drag-and drop interface makes it simple to combine big sets of data. Plus, you can use a variety of visualization options such as location charts, plot charts, etc. to interpret data. It covers the full range of business analytics: Sisense is agile and fast in giving insights. You don’t require multiple tools such as manual mashups or special scripts to run queries and gain insights. Sisense is a single platform that manages the entire BI workflow. It quickly processes raw data from multiple sources. You can speedily add new data such as tables without needing to sort or summarize them in advance. Simply integrate new supplier data or campaign metrics into Sisense to perform sales forecast analytics. Sisense analyzes data accurately and in real time: Data error can creep in when you use multiple sources to generate data and different users constantly move large volumes of data to different platforms. Even small errors can throw off the insight while interpreting big data. Sisense overcomes this problem as it consolidates data in a single location, which means your employees are viewing the same information. Sisense uses web-based dashboards which allow users to collaborate using the same insights. You don’t need to download files which means you can avoid multiple copies. This reduces the risk of altering data. Plus, Sisense uses a Crowd Accelerated BI technology which can manage hundreds of queries simultaneously. Thus, Sisense allows users to collaborate in an accurate and real-time environment which ensures you get precise outcomes. Simply refresh the dashboard to get the latest data. This is critical, if for example, you are tracking online sales during peak season. The latest data within the hour will give you a clear idea if sales are going up or down. This real-time capability makes it easier to forecast trends and perform quick interventions, if required. You can easily integrate Sisense with other products: You can use Sisense’s REST API to smoothly integrate the app with your other applications. This means you can quickly generate insights from business processes such as project management, accounting, and CRM using Sisense’s robust data analytics module. You can also visualize the data in an user-friendly interface. Integrating Sisense will turn your other applications into robust data crunchers. The other apps gain benefits such as an interactive dashboard, data preparation, strong backend for ETL, ongoing maintenance and tech support, data integration from multiple sources, quick response to queries, and creating an end-to-end solution. These benefits can help you to explore data in detail and gain deep insights which you can use to score over the competition. Sisense also offers OEM white labeling which allows vendors to customize Sisense’s look to match their application. This ensures the Sisense backend remains hidden from the vendors’ customers. Sisense pricing is also very flexible and can be adjusted to the individual needs and budget of your company. What Problems Will Sisense Solve? Sisense lets you instantly analyze and visualize both big and disparate datasets. The app’s award-winning In-Chip technology at the core of the Sisense engine allows it to effectively use CPU cache memory as well as process and prepare data only when a new query is made, allowing Sisense to easily scale to terabytes of data and thousands of users easily. Concurrent, ad-hoc queries return results in seconds, even when working with billions of rows of rapidly changing data. Analyzing complex data traditionally required an assembly line of different tools, and a department of specialists working to prepare the data for analysis and create reports. Sisense eliminates the need to use a hodgepodge of tools by letting users build complex data models in a visual environment, and giving end users the freedom to explore, filter and drill down into this data in any granularity independently, and with instant answers to ad-hoc questions. Sisense proves that you don’t need extensive IT investments and resources to tackle complex data. While other platforms might boast shifting data-related tasks to the IT department, Sisense removes workload instead of shifting it between stakeholders. The In-Chip engine’s optimal use of computational resources eliminates the need to maintain massive hardware or software stacks. Data is easily available to analysts and administrators, while IT professionals are free to focus on their core tasks. If you are interested in Sisense it may also be sensible to analyze other subcategories of Best Business Intelligence Software listed in our database of B2B software reviews. Every organization has different needs and requires a system that can be personalized for their size, type of staff members and customers, and the specific industry they are in. For these reasons, no software can offer perfect functionality off-the-shelf. When you look for a software system, first be sure what you require it for. Read some Sisense reviews and ask yourself do you want basic tools or do you require advanced functionality? Are there any industry-specific features that you are seeking? Get the answers to these queries to aid your search. There are multiple factors that you need to reflect on and these include your budget, particular business needs, your organization size, integration requirements etc. Take your time, try out a few free trials, and finally select the system that presents all that you need to enhance your firm competence and productivity. How Much Does Sisense Cost? We realize that when you make a decision to buy Business Intelligence Software it’s important not only to see how experts evaluate it in their reviews, but also to find out if the real people and companies that buy it are actually satisfied with the product. That’s why we’ve created our behavior-based Customer Satisfaction Algorithm™ that gathers customer reviews, comments and Sisense reviews across a wide range of social media sites. The data is then presented in an easy to digest form showing how many people had positive and negative experience with Sisense. With that information at hand you should be equipped to make an informed buying decision that you won’t regret. An easy-to-use and robust BI. A tool intended for greatness. A great BI tool to have. Good implementation and consistent support. Hats down for the people that created this! What are Sisense pricing details? What integrations are available for Sisense? Offering both the freedom and unlimited access to this awesome software. Pros: Great tool for analyzing bigger datasets. Really nice UI and visualizations look good on most devices as well. Cons: None so far. We had some minor hiccups at the beginning but the support was phenomenal so now all is good.